"More issues reduced their share count this quarter than last, with 308 doing so in Q4, up from 257 in Q3 and 276 in Q4 2013." "Significant changes (generally considered 1% or greater for the quarter) continued to strongly favor reductions, and also increased, as 117 issues reduced their share count by at least 1%, compared to last quarter’s 101 and the 112 which did so in Q4 2013." "Share reduction change impacts of at least 4% (Q4 2014 over Q4 2013), which can be seen in EPS comparisons, were flat at 99 in Q4 2014 from Q3, but up from the 83 posted in Q4 2013." Although the earnings growth trend appears to be slowing, cash generation continues to be strong for companies. 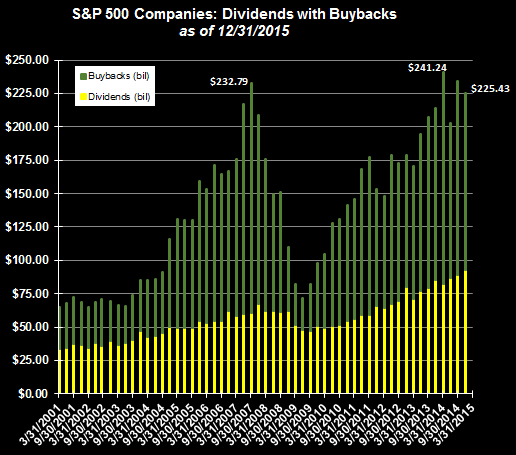 Silverblatt notes with banks now appearing to focus on dividends and buybacks, 2015 could witness another strong year for dividends and buybacks for the S&P 500 Index. This morning the American Association of Individual Investors reported individual investor bullish sentiment declined to 27.2% versus last week's reading of 31.6%. 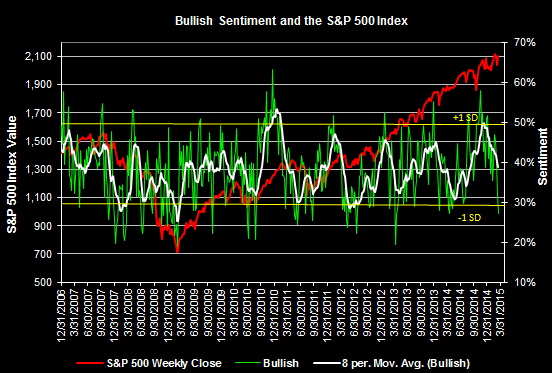 This is the lowest level for bullish investor sentiment since April 4, 2013. Additionally, today's report places the sentiment reading at one standard deviation below the average sentiment level. The decline in sentiment over the past week is proving its status as a contrarian indicator as the S&P 500 Index is higher by 2.9%. As we noted Thursday, the American Association of Individual Investors reported a further decline in its bullish sentiment reading. The reported level of 31.6% is near a level indicative of overly bearish investor sentiment. Further confirmation of this bearish sentiment is seen in Friday's equity put/call ratio which is reported at .80. As with the AAII bullish sentiment reading, the equity put/call ratio is most predictive at extreme levels or above 1.0. Nonetheless, overly bearish investor sentiment is suggestive of a near term equity market bounce. The American Association of Individual Investors reported an 8.2 percentage point decline in bullish investor sentiment to 31.6% this morning. 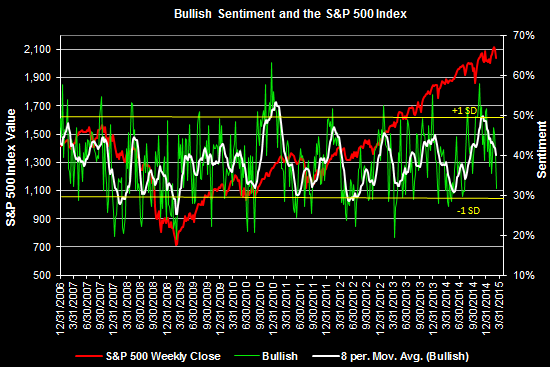 This is the lowest bullishness level since bullish sentiment was reported at 30.89% in early August of 2014. This decline in bullish sentiment has occurred at a time when the S&P 500 Index appears to be nearing an oversold level. 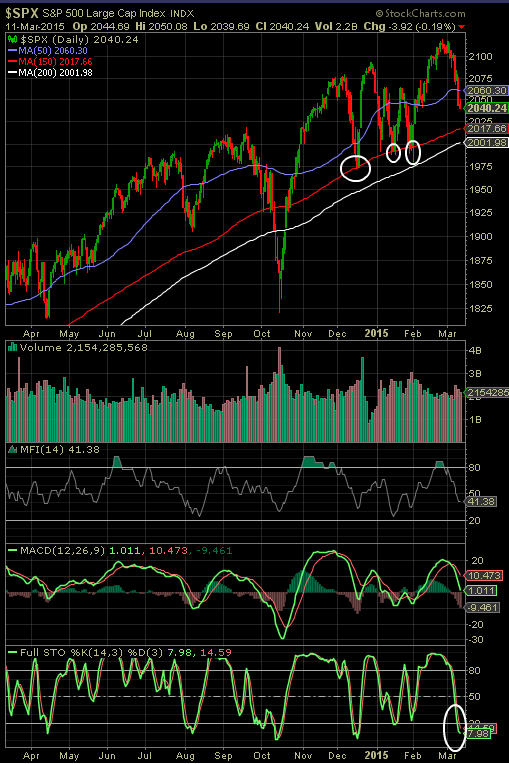 As the below chart shows, the technical stochastic indicator has fallen to an oversold level. The money flow indicator and MACD indicator have yet to confirm an oversold level; however, the market does appear to be nearing a potential bounce level. In the recent past the 150 day moving average has served as a support level for the S&P 500 Index and it will be important that this level (2017) is held in this recent pullback. 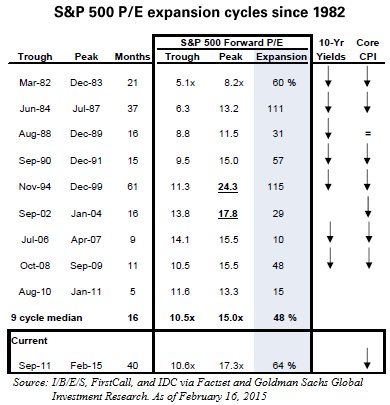 A common occurrence in equity bull market cycles is the fact that a company's valuation, or P/E multiple, expands. This so called multiple expansion is one factor that contributes to overall equity returns during bull market phases. The downside to multiple expansion is it does not occur ad infinitum. As the below chart shows, the P/E multiple for the S&P 500 Index has expanded by 64% by increasing to 17.3x earnings versus 10.6x earnings at the start of the current bull market. One factor that will cause multiple expansion to come to an end, and ultimately revert to contraction, is an increase in interest rates. The reason for this is investors will value future earnings less when a higher discount rate is used to value those earnings in equity valuation models. The market took Friday's job report as another sign the Fed is nearing a time where it will increase short term interest rates. The job report showed 295,000 jobs were generated in February. The report also noted the unemployment rate declined to 5.5%, which is the lowest level since May 2008. One data point that continues to generate differing points of view is the labor force participation rate. This part of the report noted the participation rate fell slightly to 62.8% from 62.9%. Many market strategists are viewing the jobs report as another sign the Fed is nearing an end to easy monetary policy and a rate hike in June or at the latest by the end of summer. So with a rate hike nearing, will market forces result in a P/E multiple that begins to contract? Historical data shows; however, market multiples have broadly expanded up until the time of the first rate increase. A report by Sam Stovall, U.S. Equity Strategist for S&P Capital IQ, notes, "After examining the 16 times since 1946 that the Federal Reserve started a rate tightening program, the median multiple on trailing 12-month GAAP (or “As Reported”) EPS rose from 17.7X six months before to 17.9X three months before and 18.5X on the date of the first rate increase. 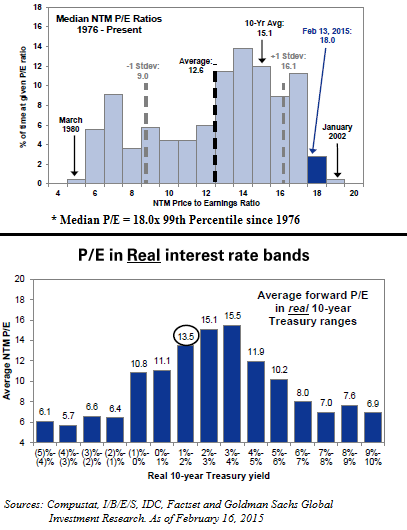 Only in the three and six months after the Fed started raising rates did the P/E median decline to 18.1X and 16.7X, respectively." In a recent report from Goldman Sachs, they include a table comparing S&P 500 returns along with the impact on valuations before and after Fed rate increases. As can be seen in the below table, P/E multiples and returns are positive up to the first rate increase. Also, given the near zero level of interest rates along with the low level of inflation, equity valuations are not as stretch as they may appear in nominal terms. The Fed does appear to be in a position where an interest rate increase is likely to occur this year. One could surmise the Fed is in a position where they need to get rates back to a more normalized level. At this near zero interest rate level, the Fed has fewer monetary options to implement in the event an economic shock where to occur. 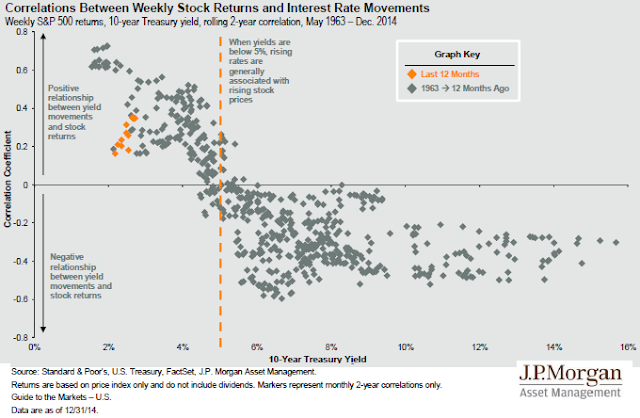 Additionally, because rates are at artificially low levels, history has shown there is a positive correlation between stock prices and interest rates when rates rise from levels below 5%. A part of the reason for this is when rates are at such extreme lows, initial rate increases are instituted simply to get rates back to a more normal level. When rate increases occur at levels higher than 5%, this can be a sign of an overheating economy with the Fed's intention to slow down the economy. 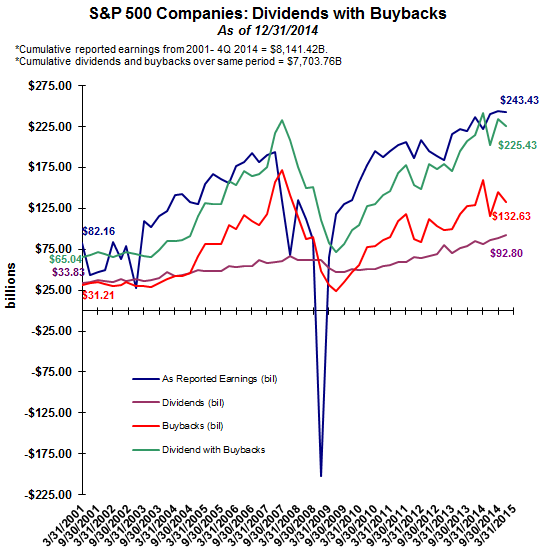 As the economy slows, corporate earnings are likely to slow, resulting in equity prices declining as well. For investors then, as a rate hike does seem near, positive equity market returns can be achieved up until the time the first rate increase occurs. Also, a portion of the returns can be generated from a continued expansion of P/E multiples.